The program will be provided at the John Deere Pavilion, John Deere Tractor and Engine Museum, and John Deere Historic Site. 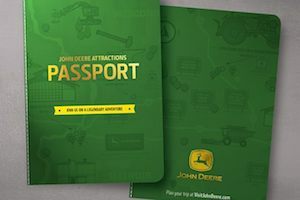 John Deere has announced the development of a new passport program, which is designed to give guests to the John Deere Pavilion, John Deere Tractor and Engine Museum, and John Deere Historic Site an easy way to log destinations they have visited. The program is free, and visitors who participate can earn gifts and discounts over time. Those who choose to participate in the passport program can start at one of the three following locations: The John Deere Pavilion in Moline, Illinois; the John Deere Tractor and Engine Museum in Waterloo, Iowa; or the John Deere Historic Site in Grand Detour, Illinois. When visiting for the first time, guests receive a location-specific seal embosser. Special events, return visits to any of the three main attractions, and trips to other Deere locations can earn guests additional stamps. Those who collect three embossed seals will earn a limited-edition Deere hat. Other stamps can help participants inch closer to a final gift, which Tapscott is keeping under wraps. For more information on the passport program or any of the John Deere locations that are participating, go to www.VisitJohnDeere.com.